Roundabouts are junctions that are beneficial in that they act as a form of traffic calming, but also allow traffic to continue without necessarily needing to stop. 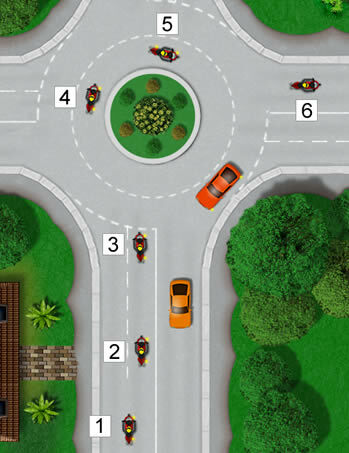 Roundabouts are intersections where multiple roads merge and so the disadvantages can be high density of traffic – particularly for vulnerable motorcycle riders. In terms of statistics, junctions, such as roundabouts represent the highest rates of accidents. Some roundabouts can be busy and complex, making observations challenging for other road users. A collision will almost certainly see a bike rider coming off worse, so as a rider, it’s essential that you carefully consider not only your own actions, but also consider drivers who might not be aware of you. 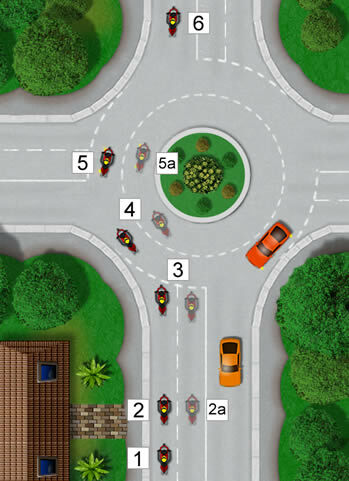 The tutorial below covers the procedure for taking a roundabout on a motorcycle. 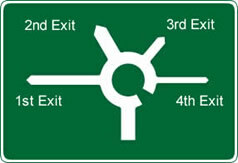 The vast majority of roundabouts will see you having to give way to any traffic approaching from your immediate right. A few roundabouts work a little differently, particularly busy or complex roundabouts where you may need to stop on the roundabout to give way to traffic entering. Give way road markings, road signs or traffic lights will inform you if this is the case. Other than mini roundabouts, these can all vary significantly in size and complexity, so the single most important aspect of dealing with roundabouts is starting with observation. Advance warning signs not only inform you of an impending roundabout, but they may also inform you of its complexity, the direction you need to take and which lane is applicable to you based on your destination. Always remain observant and look out for advance warning signs and use the OSM/PSL routine on the approach to a roundabout. Apply the OSM/PSL routine. Ensure you take effective rear observation. Signal to the left, approach and keep to the left lane. As you approach the roundabout, use an appropriate speed based on what you can, or cannot see and how busy the situation is. Quickly and continuously alternate observations between your direction of travel and traffic that is on or approaching the roundabout to your right. As you approach, always check to ensure your exit is clear. Continuously observe and prepare to stop if necessary. Avoid stopping if the roundabout is clear as this may result in a rear collision. Keep to the left lane and keep your signal on. Just before you enter the new road, take a look into the right-side blind spot (lifesaver) for other vehicles that may also be entering the lane. Take the new road and check in your rear mirrors so that you know the situation all-round. Ensure your signals have cancelled or cancel them. Apply the OSM/PSL routine. Ensure you take effective rear observation. 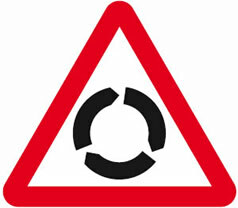 Do not signal on the approach to the roundabout. Approach using the left lane unless signs or road marking tell you otherwise. 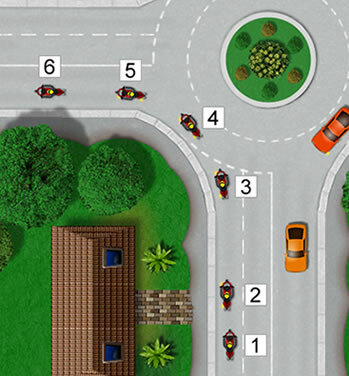 Use an appropriate speed and alternate observations from where you’re going to traffic on the roundabout. 2a. If the left lane is blocked (for example road works or a broken down vehicle), use the lane next to it. Use an appropriate speed and alternate observations (as covered in making a left turn). Check exit road is clear if possible. Continuously observe, prepare to stop if necessary. Avoid stopping if clear. Keep to the selected lane on the roundabout. Signal to the left just as you pass the exit before the one you intend on taking and observe the right (offside) blind spot to ensure all is clear from other vehicle that may be merging alongside you. 5a. Signal to the left just passed the exit before the one you intend on taking and observe the left (nearside) blind spot to ensure all is clear before crossing the lane. Check to ensure your indicators have cancelled or cancel them if they haven’t already. Apply the OSM/PSL routine and if you are moving over into a lane, make a ‘lifesaver’ blind spot check before changing direction. Signal to the right and then move into the right-hand lane. As you head towards the roundabout, use appropriate speed based on traffic conditions and what you can see. Alternate observations between direction of travel, traffic on the roundabout and if possible, check your exit road to see if it’s clear. Prepare to stop if necessary, but avoid stopping if no traffic is approaching from the right. Keep in your lane and maintain the signal on the roundabout. Just as you pass the exit before the one you intend on taking, take a look over your left shoulder (nearside) and check all is clear. Signal to the left. Enter the new road and ensure your signal has cancelled or cancel it. When using the right lane either to go ahead at the roundabout or to take a right-turn, always check traffic in the left lane before crossing into it. With roundabouts that have more than three lanes, if there are no road markings or signs which inform you in which lane to take, use the most appropriate lane on the approach based on the direction you’re taking. As a general guide, a direction to left of ’12 o’clock’ use the left lane and to the right of 12 o’clock, use the right lane.